Shannon College of Hotel Management take home the prize for the third year at the Ireland Skills Restaurant Service Final . 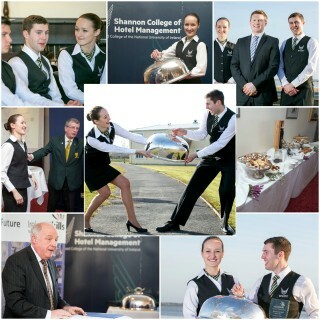 Shannon College of Hotel Management was selected to host this year’s final due to its great success in the Ireland Skills competition over the past 2 years and 2015 was no different with Alina Sile winning the overall award. This year saw two Institutes of Technology (WIT and LIT) compete alongside students from the Shannon College of Hotel Management. Over the course of the three days the competitors demonstrated craft skills in the areas of fine dining, banqueting, beverage service and guéridon service. An added attraction this year was the opportunity for the top three finalists to go forward for interview for the right to be chosen as part of Team Ireland, at the forthcoming 43rd World Skills Competition in São Paulo, Brazil in August 2015. Congratulations to Alina and Paul for their success.